HDS Carbon 12" MFD. Base price is with NO transducer. Choose transducer option when ordering. The Lowrance® HDS-12 Carbon features a new 12-inch ultra-clear SolarMAX™ HD multi-touch display using high-bright LED backlighting and advanced anti-reflective coatings to create wider viewing angles in any lighting condition. Only in HDS Carbon will you find superior color accuracy and a boosted high-resolution viewing panels specifically designed to truly maximize today’s leading sonar. Loaded with dual core high performance processor, HDS Carbon delivers faster redraw speeds and quicker response times for dual-channel CHIRP sonar, dual network sounder views, StructureScan 3D® and StructureMap™ plus split-screen views showing all this and mapping at the same time; it has enough reserve brute strength to drive future high powered fishfinding upgrades. 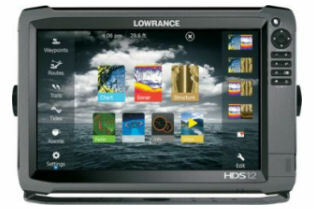 HDS Carbon brings modern “smartphone-like” comfort with integrated wireless and Bluetooth® connectivity that supports the most advanced marine technology including a Network Analyzer that notifies user when a new software is available, a system Service Assistant that allows user to transmit a detailed report of their electronics network direct to technical advisors for custom hands-on assistance. HDS Carbon is the most versatile combo available today, it can view and control Mercury® VesselView® Link, be paired with Power-Pole® shallow-water anchors, and control SmartSteer™ trolling motor/outboard motors. An expansive list of safety and entertainment plug-ins are available to complete your network. You can navigate easily with HDS Carbon behind proven Lowrance navigation, a 10 Hz internal GPS antenna and a multitude of mapping options accessible from the unit’s dual microSD card slots or via wireless download from GoFree® Shop. Easy To See: 12-inch, LED-backlit, multi-touch, SolarMAX™ HD widescreen display. SolarMAX™ HD touchscreens produce wider viewing angles from anywhere in sight. Using a unique balance of high-bright LED backlight and advanced anti-reflective coatings along with superior color accuracy and a boosted high-resolution viewing panel, a wider operating temperature range and added moisture-proof optical layers produce clear visibility in any lighting situation.